The artist; gift 1970 to NGA. Extended loan for use by Ambassador Stoessel, U.S. Embassy residence, Bonn, Germany, 1977-1981. Extended loan for use by the Ambassador, U.S. Embassy residence, Damascus, Syria, 1982. Extended loan for use by Ambassador L. Paul Bremer, U.S. Embassy residence, The Hague, The Netherlands, 1983-1987. Extended loan for use by Secretary Robert E. Rubin, U.S. Department of the Treasury, Washington, D.C., 1998-1999. In Our Time: A Billy Morrow Jackson Retrospective, Krannert Art Museum, University of Illinois at Urbana-Champaign, 1996, no. W30 and unnumbered checklist. 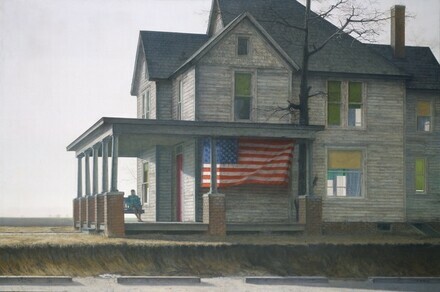 American Paintings: An Illustrated Catalogue. National Gallery of Art, Washington, 1980: 181, repro. American Paintings: An Illustrated Catalogue. National Gallery of Art, Washington, 1992: 210, repro.